Honestly, our time in St. Louis was the best. And this in particular was such a fun time. Jen lived two doors down from me, so she would come over for impromptu mimosa tastings (so we could get our proportions of orange juice to sparkling wine right). I had to make sure that we knew what we were doing at her bridal shower! Lots of preparation. When I was searching for a recipe for strawberry bellinis five years ago, I couldn’t find one. So I made my own. I had to test 3 or 4 versions of the strawberry bellinis to make sure that the flavor really popped; Alex and I did rigorous taste testing. I remain proud of this recipe. 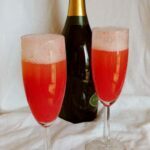 Strawberry bellinis (apparently also known as Rossinis, I find out 5 years later) are even easier to prepare than the traditional peach bellini. Simply wash and cut your strawberries, and add sugar and creme de cassis. Blend, then strain through a sieve. Chill until ready to serve. To serve, mix one part mixture with two parts sparkling wine. I originally made these in August 2013, and even now, it isn’t quite strawberry season yet. With off-peak strawberries, the puree definitely needs a little sugar. If you use really good, in-season strawberries, you may not need to add anything to your strawberries. The off-season strawberries also need a little extra flavor to make them pop. I added creme de cassis since I had some around; it’s pretty easy to find. However, you could probably add creme de fraise (strawberry), or Chambord. The creme de cassis adds a little alcohol to the puree. If I wanted to mix this with sparkling grape juice instead, I would add a little grenadine or a flavorful juice to the puree to make it completely non-alcoholic. What kind of sparkling wine should you use? I’m pretty sure we often bought Blanc de Blancs (the name makes us laugh) at Trader Joe’s when we lived in St. Louis. Otherwise a prosecco definitely works, and I think a cava would work too. There’s no need to use anything too expensive. If you end up with extra puree, just freeze it! I froze our extra puree in little heart-shaped ice cube molds from Ikea; little hearts are very cute floating in sparkling wine. You’ll want just under 3 tablespoons puree for a 4-ounce pour of champagne. What Should I Serve with Strawberry Bellinis? Serve anything you want! If you’re serving them for brunch, I bet Strawberry and Cream Scones would be lovely, with fresh fruit on the side. Since you prepare everything for strawberry bellinis in advance, make the morning easy on yourself and prepare something else in advance to go with it, like scones or a coffee cake, or maybe cinnamon rolls. It will make for an incredibly relaxing weekend morning. Like this recipe? Rate it and comment below! 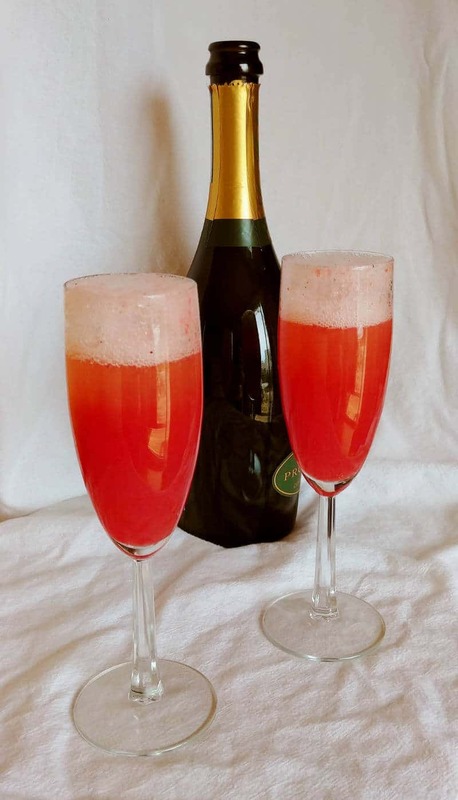 Strawberry Bellinis are an easy-to-make, springtime twist on the classic bellini! Just puree strawberries, sugar, and creme de cassis, strain, and mix with sparkling wine. A perfect cocktail for brunch. Cut tops off of strawberries. Puree strawberries, creme de cassis, and sugar. Strain through a sieve; this is important as it removes seeds. Chill puree until ready to serve. To serve, combine 1 part strawberry puree with 2 parts sparkling wine. 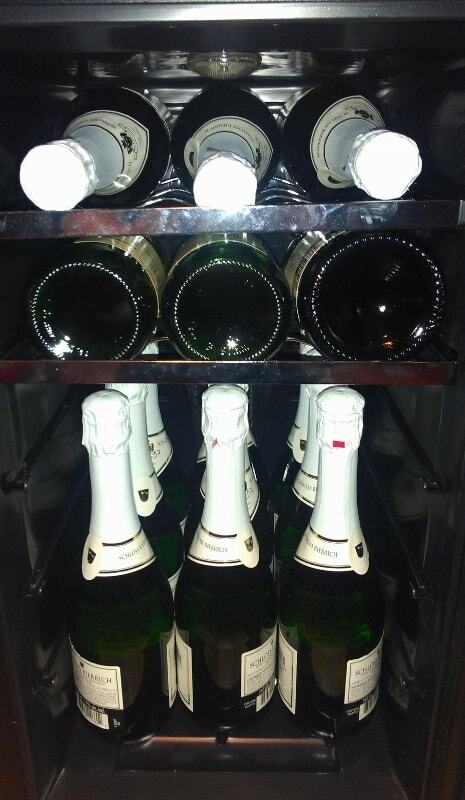 You won't be able to pour all the champagne at once due to the bubbles. Stir to combine after the first pour, then top with bubbly. This yields between 6-9 drinks, depending on the size of your champagne flutes. If you have extra puree, freeze it in ice cube trays. You will want approximately 3 tablespoons per 4-ounce pour of sparkling wine. I used creme de cassis to make less-flavorful strawberries pop. I expect you can use creme de fraise (strawberry) if desired. Chambord probably works too. To make the puree to serve with sparkling grape juice, add grenadine or a good juice instead of creme de cassis to enhance the berry flavor. You may need to add a little more sugar to the puree; it should taste sweet. Edit: This recipe originally listed 2x the amount of ingredients needed for the puree. The amounts listed above are correct.